Are you a fan of coconut macaroons? 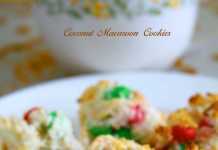 If yes, I’m sure that you will love these vibrant coconut cookies studded with nuts and candied fruit. Unlike the usual macaroons, these cookies are baked in miniature muffin tins. See if its a good idea or not in My Notes section. 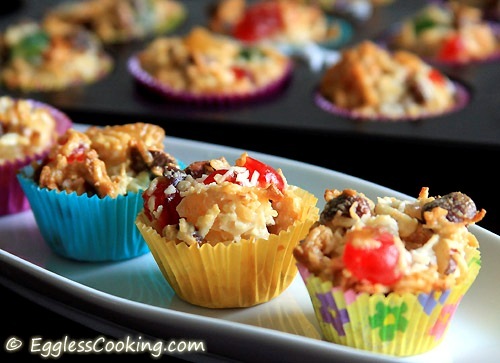 I wanted to bake something colorful and beautiful for a Hawaiian themed party and while looking around for recipes I found this lovely recipe for fruitcake style coconut cookies. This is yet another Taste of Home recipe which is a big success. These fruit morsels came out so yummy, actually very sweet for me though. 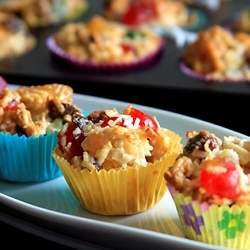 This is beginners’ level baking, with simple ingredients and very easy to put together. This is no way healthy, but should be okay for “once-in-a-while-indulgences”. Follow my suggestion to bake these on a cookie sheet and serving them on colorful paper liners and its sure to be a hit wherever you bring these. If you like coconut macaroons, you’ll like these coconut cookies as well. Preheat oven to 300F/150C for 15 minutes. Line miniature muffin tins with paper liners. In a large bowl stir together the first 5 ingredients. Mix in the condensed milk. Fill in each cup with a tablespoon of the mixture. Bake for about 20-25 minutes or until golden brown. Mine were done in about 23 minutes. Use any nuts of your choice. I used chopped hazelnuts and walnuts. The one thing I wish I had done differently was to bake these on a cookie sheet and then serve it in miniature muffin liners instead of baking it directly in the cups. The disadvantage of baking these in the muffin liners is that you can’t peel the cookies from the paper. It sticks to the liner. That’s the reason the recipe instructs to store these cookies for 24 hours before serving because that’s when the cookies peel off. So you have to plan ahead. So the solution is to line a baking sheet with parchment paper and drop the batter by tablespoonfuls and bake them until its golden brown. 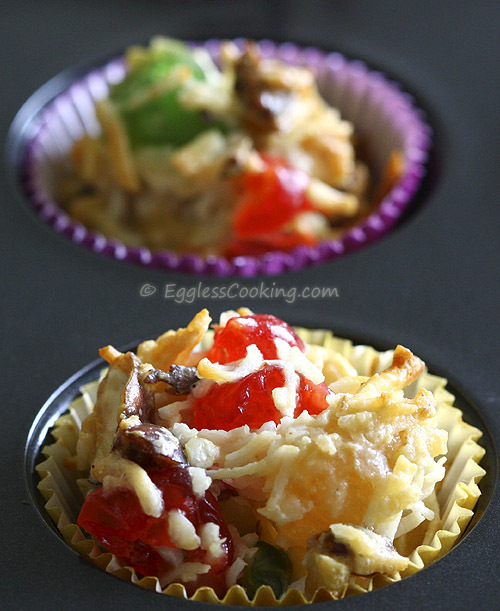 Once it is cool oven serve it in cute little colorful muffin liners. I stored these coconut cookies on a big baking sheet and covered it loosely with a newspaper because I didn’t have enough airtight containers to store about 15 dozen cookies. Do not store them in the fridge because it becomes even more sticky. The original recipe uses 2 cups of condensed milk. I did the same for my first batch and found that the batter at the end had too much condensed milk than it requires making the cookies look like muffins. So when I prepared the mixture for another batch I reduced the quantity of condensed milk to 1 and 1/2 cups and felt that the cookies looked beautiful and similar from start to finish. Good day to you! 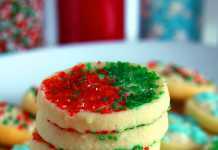 I tried this recipe (Christmas in Hawaii) today and followed your instruction of spooning the mixture onto a parchment paper that was lined on a baking sheet. My cookie was not done in 23 minutes, so i left it for another 10 minutes. The problem is the cookies have all stuck to the parchment paper. I am little worried as how to remove them from the parchment paper. It is not yet 24 hours since I baked them. 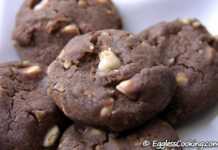 Can you please advise me on how to remove the parchment paper from the cookies? Thank you and look forward to hear from you ASAP. Hi Lakshmi, did you spray the liners with some non-stick cooking spray? I usually do that for all my muffins and cupcakes too so that it’s easy to remove it. Try keeping it the refrigerator and see if it works. Very colorful Madhuram. All the ingredients are very tempting to try and my daughter will definitely like them. Cookies looks fabulous and adorable. the cookies came out that were stuck to paper. Good luck. Thank you very much for the tip Neela. I’ll remember it for the next time.